Anyone's who has ever met my son knows that he is obsessed with Disney/Pixar's Cars. The entire movie is memorized, he has almost every toy from the movie ever made, he wears the t-shirts, jammies, backpack, shoes and slippers. The red McQueen face is always somewhere within reaching distance of our little boy. It's been this way for almost 2 years now. For the last six months I've been annoyed with it. Sick of seeing the smiling bumpers and the twinkling eyes in the windshield of every vehicle in the house. Last week I sat down in the living room to feed Owen while Ethan played at my feet with his "Car Friends". I had flashbacks of life before The Cars Movie. Ethan loved cars. He loved the wheels. He loved in mechanics of it all. He would lay on the ground at eye level and watch the wheels of his little toy cars roll back and forth. 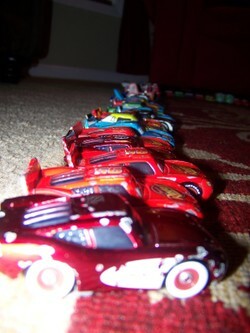 He would line them up in specific orders and then he would go down the line, watching each cars wheels roll back and forth.... for hours on end. Everyday. The same game, the same order, the same routine. We bought him cars because we knew he loved them. (Just not the way most 2-3 year old boys love their cars.) There were never city scenes, there weren't tracks or races or construction sites. Just wheels and perfectly lined up rows. Even as I sit typing this now Ethan has gotten home from school and the first thing he asked for when he walked in the door was "please I play Lighting friend cars, for long long time?". See? Now there is a difference in his play. These toys have been the thing to connect Ethan's two worlds. His autism bubble world where he can stim for hours and ignore everyone/thing else and his family/real world that we're trying to pulling him into more and more everyday. The Cars Movie has taken Ethan's love and given it a human aspect. The one thing he struggles with the most. It has taught him feelings, and communication. They're cars that talk! What started out as him scripting the movie, over and over turned into him understanding what they were saying then it turned to him understanding the emotions of the scenes. He plays cars now and they go into Flo's V-8 cafe 'because they're starving'. They got to Ramone's body shop because 'they need a new coat of poly'. They play tricks on each other 'like tractor tipping' and they race each other for the piston cup. 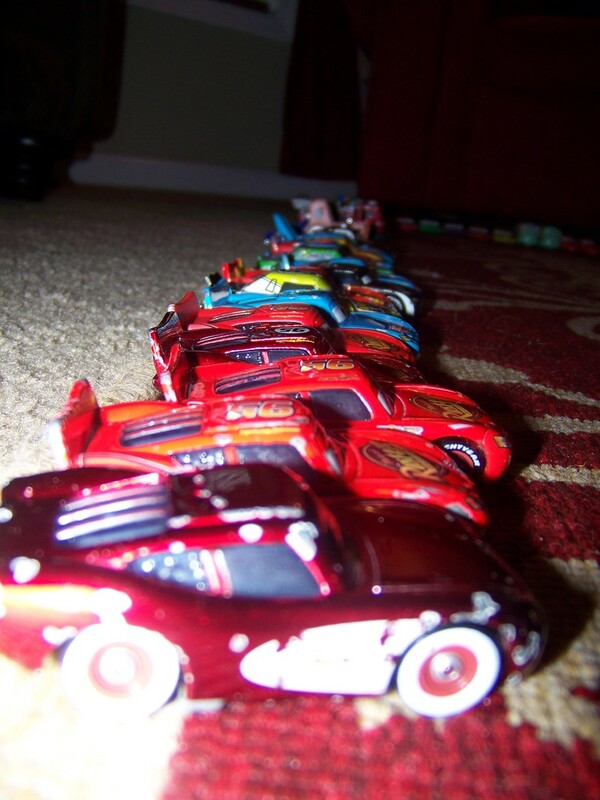 Yes, they're still lined up in a specific order on a regular basis and yes, he can't go to sleep at night without stimming for an hour or so with 'Radiator Springs Lighting McQueen'. But, I realized he has translated all of those things into his life. He is figuring out how the world works through this show that has had an amazing impact on his development. It's so fun to realize his improvement and progress and to realize how his mind understands the world around him. I wish I could take credit for his amazing progress over the last year but, in truth I was such a little part in helping him to understand everything. It's only after the fact that I see what actually made the connection. I guess what I'm trying to say is that I'm proud of our little boys improvements and progress over the last year and a half. He has pushed through so much and even though it's been harder then it should he is coming out a stronger, smarter person. and Thank You Pixar. I'm sure in development of the movie you didn't have this as an end result in mind but, it's made a big impact on our family connecting to our son.